Let’s talk about some stuff that can enrich your coffers quite handsomely in 2016. Actually, for the rest of your life if you choose. In fact, if you follow the model I’m about to reveal, you can create just about ANY lifestyle your greedy little corazón desires. Even a “fly-around-the-world-on-private-jets-surrounded-by-scantly-clad-buxom-beauties” lifestyle, if that’s your thang. Here’s how I made a quick and easy extra $205,000 last year working just part time… for only a few months last year. That $205,000 was generated from a list of only 130 people! Which means, only counting coaching income from the previous 12 months, I made $1,576.92 per person on my list! I’m not going to include subscription, consulting, copywriting, royalty and equity income generated from this list in the previous 12 months. Over a half a million bucks from a list of only 130 people! Look, I’m not telling you all this to brag. Just inspire. Because if little ole moi can pull this off with a teeny tiny list, what’s to prevent YOU from doing it, too. But you gotta know the secrets to making big money from small lists. And that’s exactly what you’ll soon have the opportunity to discover. 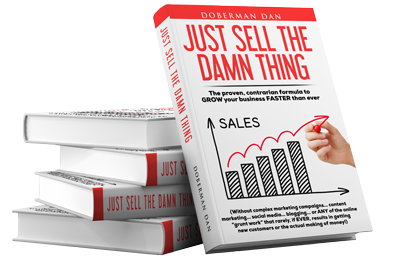 In the January issue of The Doberman Dan Letter I’m revealing the system I used to make that income from such a tiny list… A-to-Z. And I’m convinced YOU can do it, too. In fact, with my help, I expect you to do BETTER than I did. The January issue of The Doberman Dan Letter went to press TODAY. And will be arriving in my knights’ mailboxes any day now. P.S. You really can make a lot of money with a small list. But one of the big secrets to doing that is the SOURCE of the people on your list. If you follow the advice of all the “experts, you’re gonna work REALLY hard… but only make a pittance. Click here to find out the best way (MY way) to make BIG money from a small list.